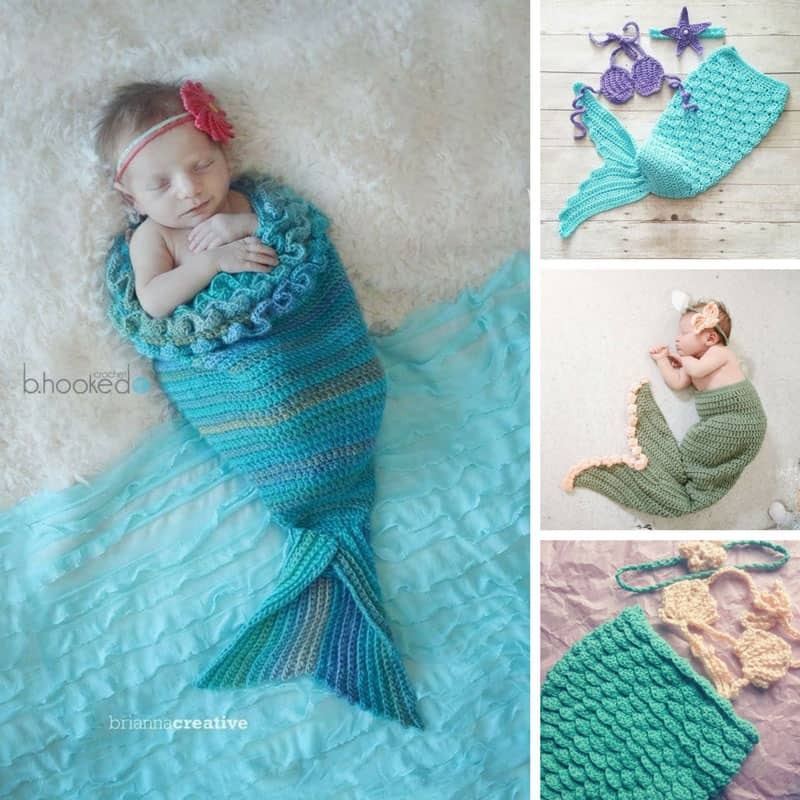 These crochet baby mermaid tail patterns are a must make if you are a planning a newborn photo shoot. Be sure to watch the video tutorials to show you how easy they are to make. There is one thing I regret doing with my children when they were newborns, and that is having a photography shoot with them. You know the ones I mean where they dress the babies up to look totally adorable and capture their sweet innocence. Like mermaids for example. 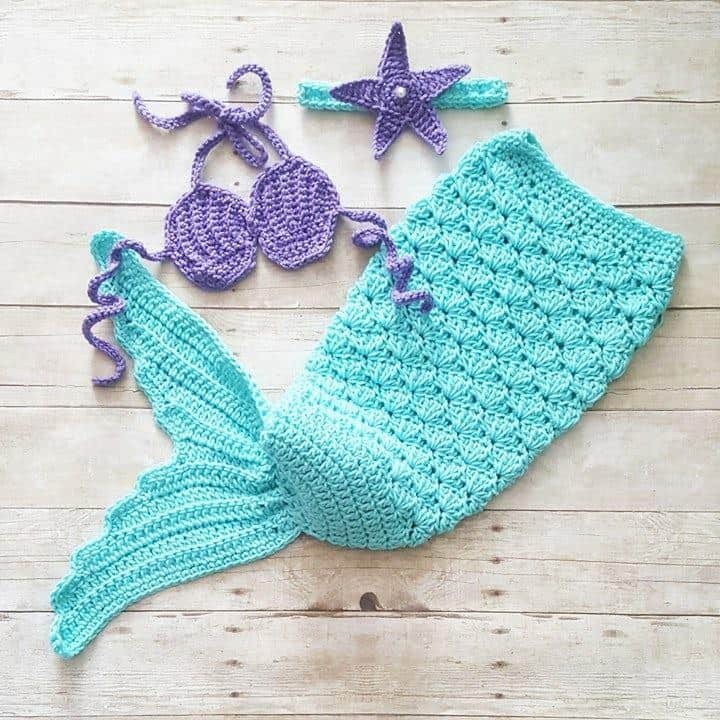 Whether you’re expecting a baby, or looking for a unique baby shower gift to make for a friend you need to take a look at these gorgeous crochet baby mermaid tail patterns. They’re just magically adorable! Don’t forget to scroll all the way to the end of the page to see all of the gorgeous designs, and save your favourites to your crochet board on Pinterest as you go. Oh and if you can’t actually crochet don’t worry, I found a couple of ready made sets that you can buy from Etsy! If you like to want YouTube videos so you can actually see how a pattern comes together this easy to follow tutorial will help you master crocodile stitch! 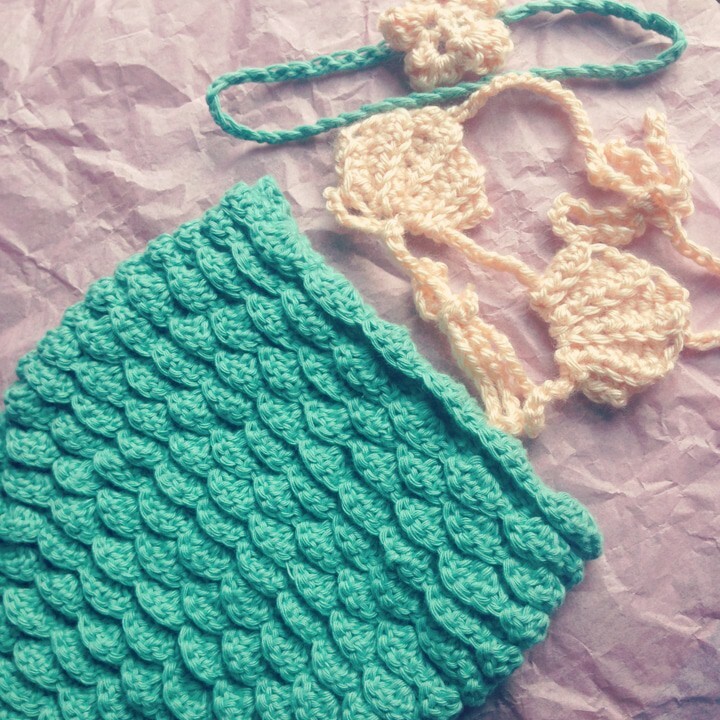 Kayla made this gorgeous baby mermaid outfit as a Baby Shower gift for a friend. She used a super soft cashmere and organic cotton blend yarn in teal for the tail, and then a soft pink for the bikini top. I love the intricate scale-like detail on the tail! The pattern Kayla used is this one over on Ravelry. This easy to follow pattern comes in three sizes to suit a newborn baby through to a toddler. I love the detail on the tail and the starfish headband is a cute way to finish up the outfit! I love Brittany’s crochet projects and she really knocked it out of the park with this mystic mermaid cocoon pattern. Just look at that ruffle around the top edge! 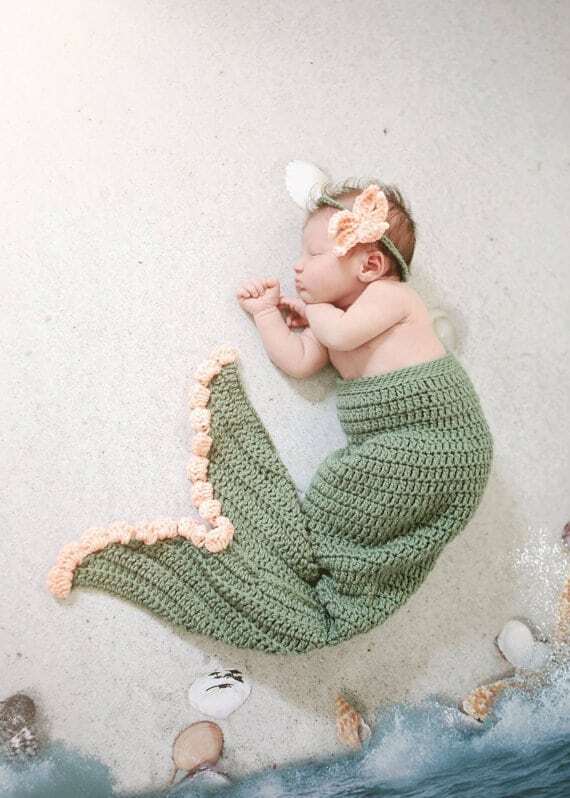 The great thing about this mermaid tail is that it starts out as a cocoon for teeny newborn babies (just perfect for an adorable photo shoot) and then can also be used as a mermaid tail for older babies. 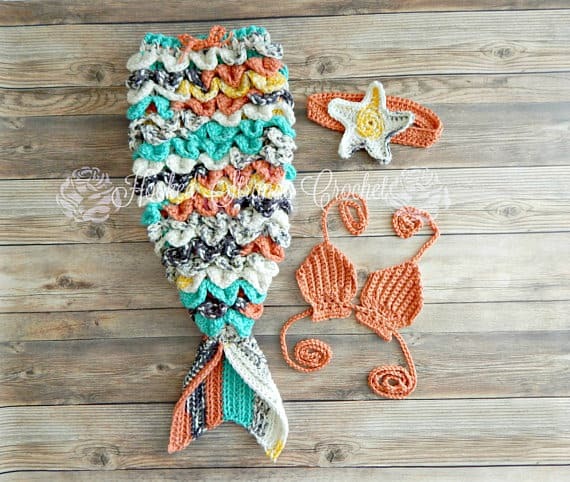 Oh my, how darling is this mermaid tail? It is designed to fit babies from 0-6 months and the applique details really make this tail stand out from the crowd! If you’re looking for a baby mermaid tail to buy then take a look at this gorgeous photo prop set. 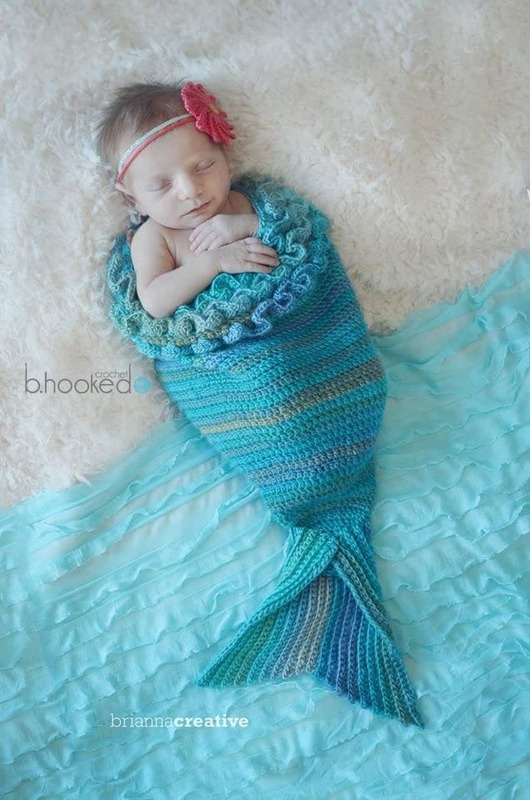 I love how it includes a red wig so your baby will look just like the Little Mermaid Disney princess! You’ll need to know how to make magic circles to work up this crochet tail, but the pattern does include photographs to help you along the way. I love the coloured trim on the bottom of the blanket that ties in with the headband! 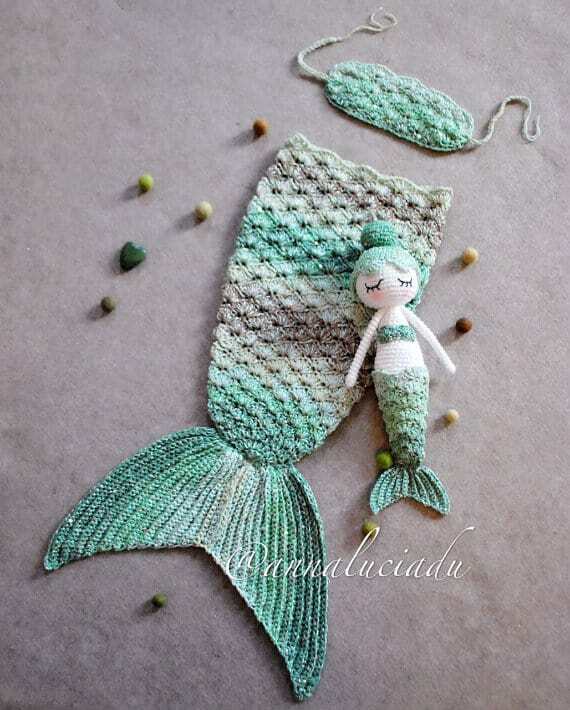 This newborn tail pattern is beautiful with the variated colours, and I love that the pattern includes instructions to make a mermaid doll for your baby too! 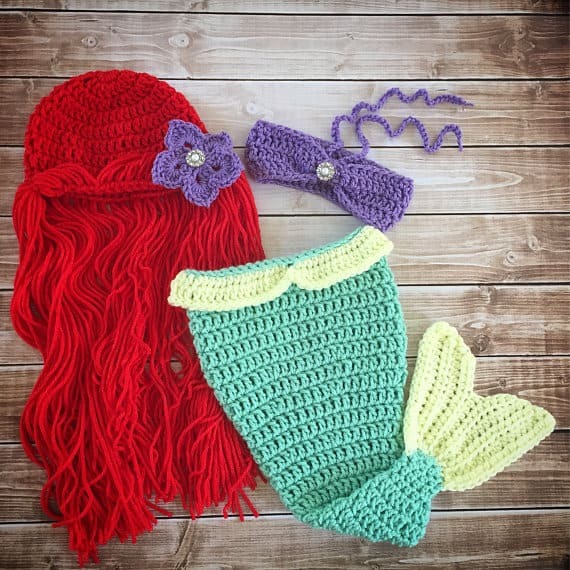 If you’re looking for a crochet mermaid tail prop set for newborn photographs but you can’t crochet don’t worry because this set is ready made and ready to ship! I am in love with the tail pattern that looks like ruffled ribbon with all those beautiful colours! 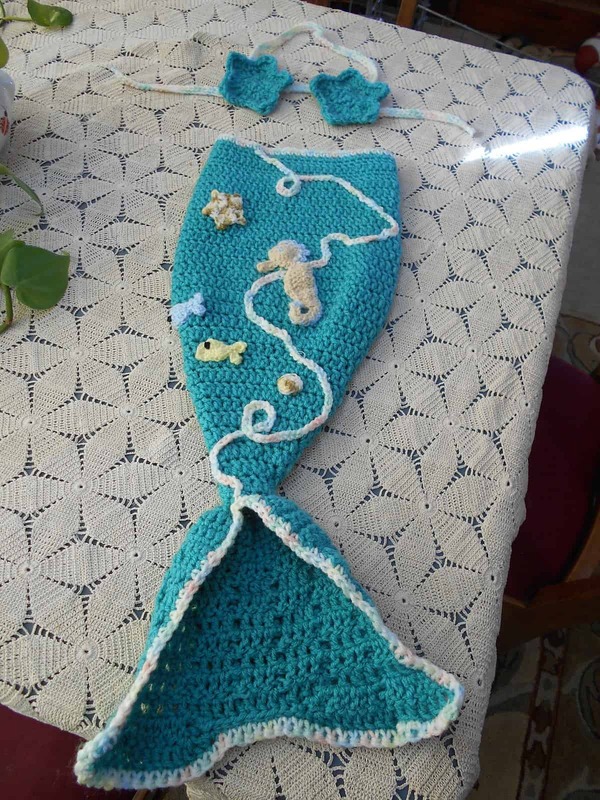 Here’s another baby crochet mermaid pattern free video tutorial from YouTube for those of you who like to follow along as you crochet.